My fondest memory of my time in Malaysia often includes food. 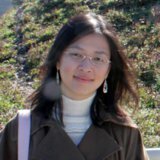 It was a period in my life where I left home for the very first time and not cooking, so I ended up eating out every single day, at least twice a day, for close to one and a half year. What can I say, I was young and up to that point in my life, was super pampered by my Mom’s cooking, also my cooking skill at that time was non existent! Plus to be honest, eating out in Malaysia was so cheap, in fact, my Mom who visited me back then made a quick calculation and told me to better just eat out since it didn’t make any economical sense to cook for myself anyway. So I went on to have many happy eating adventures while staying there. To be honest, I never again have the opportunity to indulge myself in so many outside food since my brief Malaysian stint. One of my favorite food in Malaysia kinda involve curries, and they come in so many different flavor and variety, chicken, fish, lamb, and depend on whether it’s a Chinese owned store, or Malay owned store, or Indian owned store, the flavor can be very different and each super unique and equally delicious. 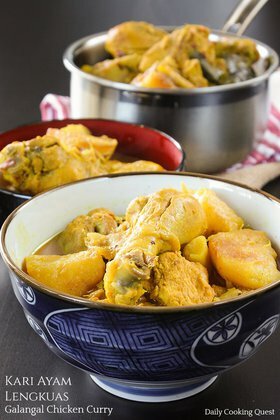 This chicken curry Kapitan is one of my favorite Malaysian curry. 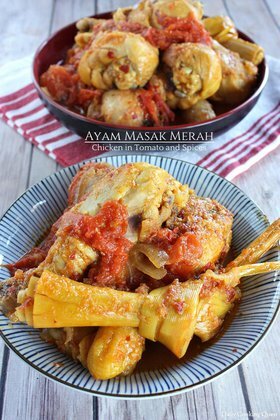 Like Indonesian dishes, it is also very typical for Malaysian dishes to have a long list of spices in the recipe. It may seems like a lot of stuff, but honestly the prep work is really quick. Mostly, you just need to dump a lot of spices into a blender/food processor and blend away into smooth paste. 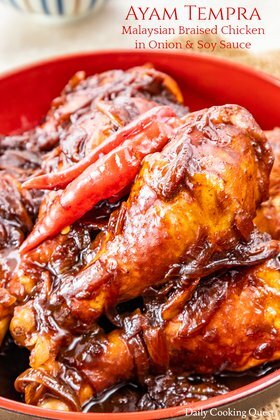 The cooking process is also equally easy, cook the wet spice until slightly dry, then add oil and fry until the oil is separated, then add chicken and the rest of the ingredients into the pan. From then on, it’s basically simmering and simmering until sauce is reduced and thick. 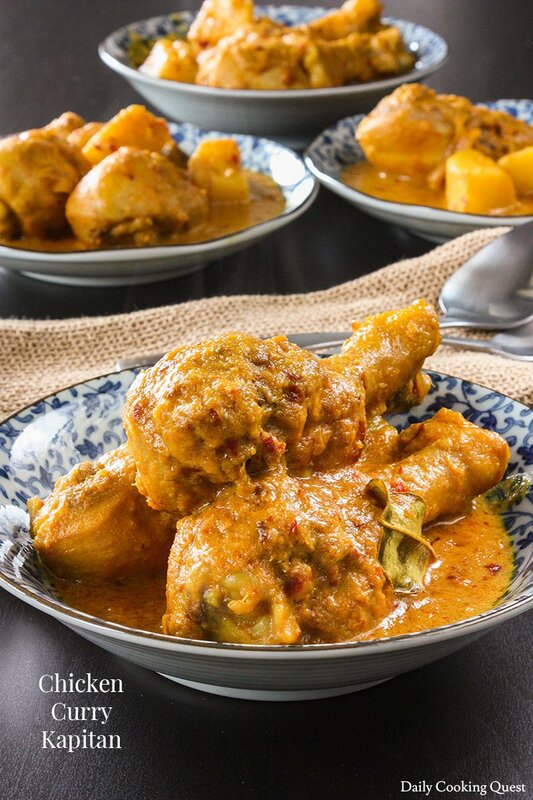 Since this is a Malaysian dish, you can eat this chicken curry Kapitan with steamed white rice, or your favorite roti or naan bread. The sauce is to die for, so mop up every single last drop and lick the plate clean. In a wok over medium heat, mix together spice paste and ground turmeric and cook until slightly dry. Add cooking oil into the wok, mix well. Cook until oil starts to separate from from the spice. Add chicken drumsticks, mix well. Add kaffir lime leaves and water into the wok, mix well. Bring to a boil. Reduce heat to a simmer and cook for 10 minutes. Add coconut milk and potato into the wok, mix well. Season with salt, sugar, and fish sauce. Simmer until the sauce is reduced and thickened, about 15-20 minutes. Add lime juice, cook for 1 minute. Adjust seasoning as needed. Turn off heat. Serve with steamed white rice, Indian roti or naan bread. Hi Anita, my son loves curry chicken but with no spice. He can't take heat 😥. Can you develop a curry chicken recipe without spices for him? Hi Lynn, do you mean without any chili? or without any spice at all? Because even the simplest one with just curry powder will already have spices in it, and to be honest I don't know if anyone can make curry without spices. If it is without any chili, you can use this exact same recipe, just don't add any of the dried chili. If he can tolerate a tiny amount of heat, I would suggest using 1 teaspoon of paprika powder (not red chili powder) to at least give the curry that slight reddish hue. Happy to help Lynn :) Have fun trying out the recipe.